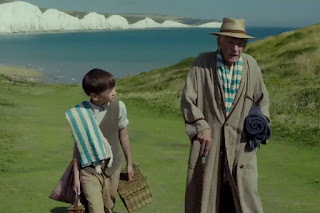 On Friday, I had the pleasure of having seen the beautiful film, Mr. Holmes. Ian McKellen was, as expected, brilliant as Sherlock Holmes. As a film, in and of itself, it was beautifully photographed, well-written and wonderfully executed in every way. Most importantly, though, it gives us back a Holmes that has been slowly blanched away over the years; the "real" Sherlock Holmes. In my estimation, the movie vindicates Sherlock Holmes -- rescues the character from the common perceptions that were, in my opinion, sown by Jeremy Brett and reaped by Benedict Cumberbatch. Sherlock Holmes might be the most commonly portrayed character in literary history. Even during Doyle's years of success in the late Victorian era (in which people many people believed Holmes was real), Holmes was being portrayed on the stage. On film, Basil Rathbone became the Holmes, for quite awhile and, sadly, alongside him, Nigel Bruce turned Watson into a sort of blithering fool in popular perception. (He has since been saved from that fate by the likes of David Burke and Edward Hardwicke (BBC, with Brett), Jude Law and, masterfully, by Martin Freeman (Sherlock, BBC). Rathbone had most of the elements of Doyle's written Holmes, from his described (and illustrated) appearance to his rapid shifts from languid boredom to high-energy (and physically quirky) fits of enthusiasm. Courageously, the producers even allowed reference to Holmes's use of drugs to fend off boredom -- at least, in The Hound of the Baskervilles: "Watson! The needle." 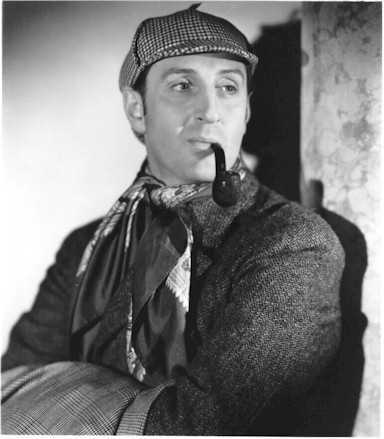 Between Rathbone and Brett, there were several Holmes portrayals, but none really significant. When Jeremy Brett came along, I was disappointed. Many like him, but I found his portrayal to be a bit disturbing. I couldn't help but think Brett's Holmes was the kind of guy I wouldn't leave my kids alone with... his quirkiness seemed unwholesome in some way. And with Brett, Holmes started to be more closely associated with what amounts to something more subtle in the actual texts; he turned from the socially uninterested fellow to a rude and self-centered person. One could easily diagnose Brett's Holmes with Asperger's syndrome. McKellen's Holmes and his buddy Roger. I should not be surprised by the extreme characterization of Holmes. It is very fashionable to be messed-up in the head, these days. There is a common perception that a genius must, as part of his resume requirements, be a mentally unhealthy person. I disagree strongly with this and I also disagree strongly that Holmes, on the page, is ever even close to either Asperger's or to the level of a high-functioning sociopath. That said, interpretation is what keep literature alive and a character like Holmes can only benefit by fresh renditions. Therefore, I am glad that McKellan came along and wrenched Holmes back into what I think is the proper place. He is a man who, though brilliant about logic and in following in the footsteps of human action, never really gave time to understanding the human heart; who (and this is in the text) dismisses love and friendship as something that is unnecessary and that is a hindrance to his work. But, McKellen's Holmes is is sympathetic and likable, but never saccharine. He even -- ironically, considering my statements about Brett -- mentors a the little boy of his housekeeper in a relationship that is as beautiful as that of any grandfather and grandson. Let it suffice to say that the elderly Holmes finds many things he has long lacked, after great trials. While I am a lover of the Sherlock Holmes stories, I have never been a detail freak. It is the character that I have always loved, not the memorization of the contents of 221B or the regurgitation of Holmes's steps to solving the mystery of "The Five Orange Pips." I like Sherlock Holmes and I recognize his flaws and I admire his tremendous strengths. Ian McKellen and Mitch Cullin (the writer of the screenplay based on his own novel) gave me back the Holmes I knew: a man who I would, in fact, leave my sons alone with because not only do I trust him but I believe they could benefit from not only his example of logic and brilliance, but, also, from his kind heart and good humor. See this movie, especially if you love Sherlock Holmes. I loved the Brett series but I know what you mean. The actor had a very dark side that informed his interpretation of the character and when Brett's mental and physical health began to decline, Holmes became increasingly harder to like. Towards the end, a friend of mine who wrote some of the scripts would have to do eleventh hour rewrites, bringing in Mycroft as the main character - I think they had Charles Gray on speed dial. I'd like the modern Sherlock more if it wasn't quite so slick and postmodern, but at least it's quirky and entertaining, unlike some recent BBC dramas. I'll look out for the Ian McKellen - it sounds promising from your description. Steerforth -- I liked the writing on the Brett series very much, which made it frustrating, not liking Brett himself... I didn't know much about Brett's decline or that it was happening as he worked on the series. Very eye-opening.